If being a university graduate was a determining factor for a person to succeed in life, then Matt Damon would have been a pauper. The actor, film producer, and screenwriter made his movie debut as a young man of 18 years and was eventually shot into limelight after he starred in the 1997 movie, Good Will Hunting. 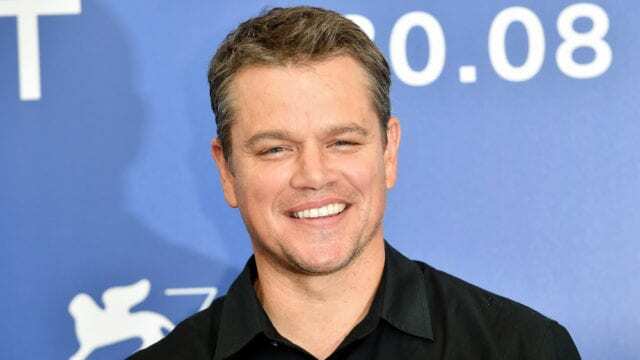 Even though the Bourne franchise star never got his English degree from Harvard, Damon’s accomplishments as an actor paved way for him to return to the school to receive the 2013 Harvard Arts Medal. Today, he is on Forbes magazine’s list of most bankable stars, he is among the Hollywood actors who receive the fattest pay cheques and has received numerous awards and recognition. The talented actor was born on the 8th of October, 1970, in Cambridge, Massachusetts, with the full name Matthew Paige Damon. He schooled at Cambridge Alternative School (later changed to Graham and Parks) and Cambridge Rindge and Latin School. His acting journey began way back when he was very young, acting in different high school stage plays. According to Matt, his drama teacher, Gerry Speca, influenced him artistically. After high school, the movie star was admitted into Harvard University in 1988 to study English and there, he continued honing his acting skill by taking part in different student theater plays. He eventually made his first appearance in a film in 1998, at age 18 and continued playing small roles in films until he decided to abandon his university education in 1992 to play a lead role in the 1993 film, Geronimo: An American Legend. From the time Matt launched his acting career in the film industry, he has continued to grow and is now classified among Hollywood’s main box office attractions. The movie, Good Will Hunting, which he co-wrote with his friend, Ben Affleck, made $225 million at the box office globally and earned him a salary of $600,000. He earned $5 million for his role in The Talented Mr. Ripley and in the year 2000, he made $7 million for The Legend of Bagger Vance, following it up in the same year with $5.5 million for All the Pretty Horses. After a little decline in popularity, the actor landed a role in Ocean’s Eleven alongside some already-made actors and made $5 million. Apart from acting, Matt Damon has also raked in a substantial amount of money as a producer. He produced movies such as Stolen Summer, The Battle of Shaker Heights, and Feast, making well over $10 million from them. Thanks to all of these endeavors and more, Matt Damon sits pretty with a net worth of over $170 million. Matt Damon is the second of Kent Telfer Damon and Nancy Carlsson-Paige’s two sons. His father, a stockbroker, and realtor, also worked as a tax preparer while his mother, a professor at Lesley University, specializes in early childhood education. While Damon grew up to become an actor, his older brother named Kyle Damon, became a sculptor and an artist. When he was only 2, Damon’s parent’s marriage went sour, resulting in divorce in 1973. After the couple parted ways, the entertainer and his brother alongside their mother, moved back to Cambridge having relocated to Newton shortly after Damon’s birth. They were raised solely by their mother, in a communal house built for six families. On 14th December 2017, Damon’s father died in Massachusetts at age 74 after battling cancer for a long time. The actor got married to Argentine Luciana Bozán Barroso on December 9, 2005, in a quiet ceremony which held inside New York City Hall. The couple met at a bar in Miami while Matt was filming the comedy film, Stuck on You, in 2002. Two years after dating, the actor, certain that he had found ‘the one’, proposed to Luciana in September 2005 and she said yes. After eight years of staying married, the couple renewed their vows and unlike their first wedding, the celebration was big and attended by many of their family and friends. According to reports, the ceremony which took place in Saint Lucia gulped a whopping $600,000. The couple’s marriage has been blessed with three daughters. Luciana was already three months pregnant with their first daughter when they got married and on June 11, 2006, the baby named Isabella, arrived. She was followed by Gia Zavala on August 20, 2008, and Stella Zavala on October 20, 2010. Damon is also a stepfather to his wife’s daughter, Alexia Barroso, from her previous marriage to Arbello “Arby” Barroso. The super-talented actor measures 5 feet 8 inches in height and weighs 185 lbs (84 kg). He has light brown hair, an outstanding pair of blue eyes and wears shoe size 11 (US) or 10 (UK) or 45 (EU). Being a good actor involves a lot of sacrifices, including adding and shedding some weight when there is a need for it. This was why Matt Damon placed himself on a diet and fitness regimen which made him lose 18 kg in 100 days just to fit into the role of Specialist Andrew Ilario in the 1996 movie, Courage Under Fire.